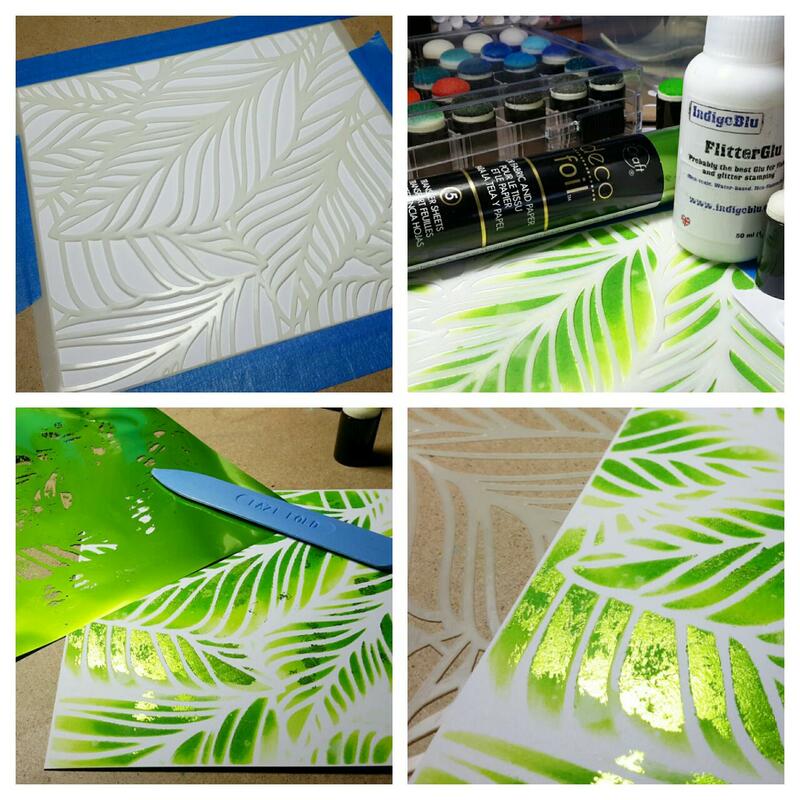 This beautiful 6"×6" stencil is called Fallen Leaves. 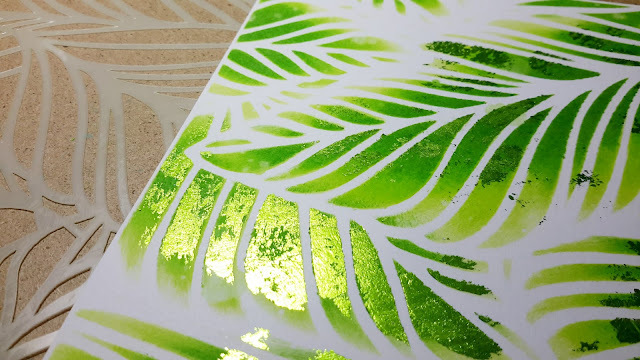 I started by taping down the stencil over a 6" × 6" piece of white card with low-tack masking tape and used daubers to apply a selection of lush green Distress Ink colours. 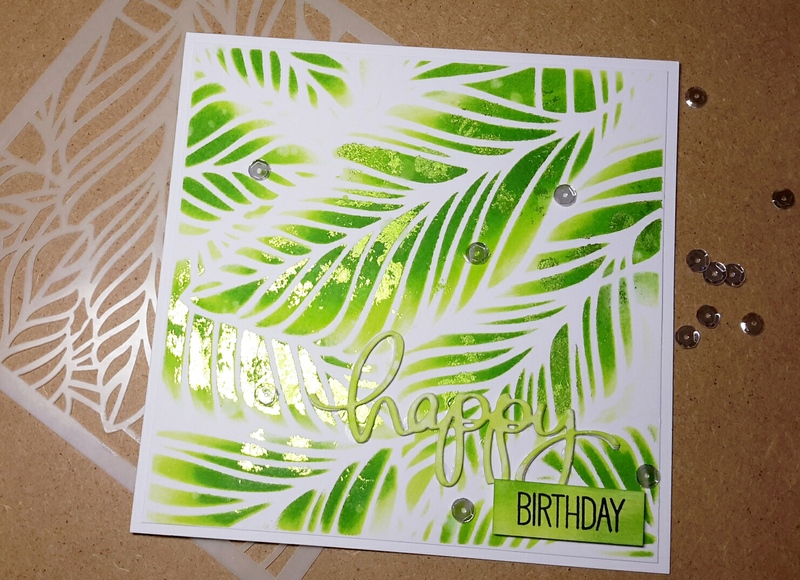 I then dabbed some FlitterGlu about and added some Lime Green Deco Foil highlights. You don't need a fancy laminator to use this foil, FlitterGlu works perfectly!! This stencil is going to be brilliant for cards throughout the year as you can change the colours to match the season. 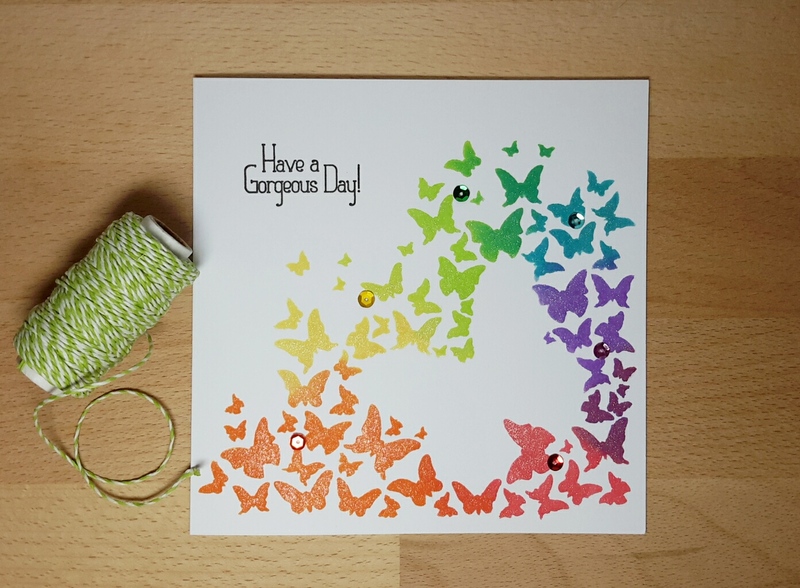 This is just another quick sample (which hasn't been made up into a card yet or been given a background colour). 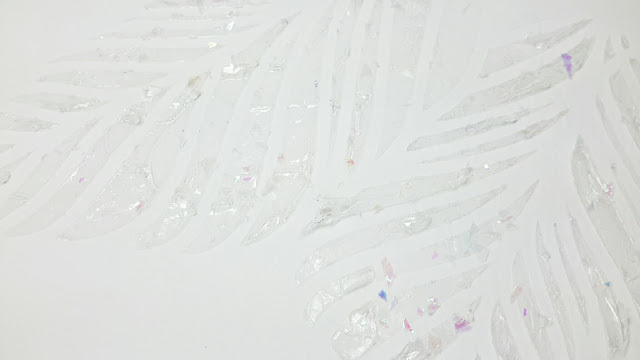 This time I used Liquitex Super Heavy Gloss Gel on the stencil and sprinkled flakes of 'glittery stuff' in it before it dried (sorry I can't remember what it's called). 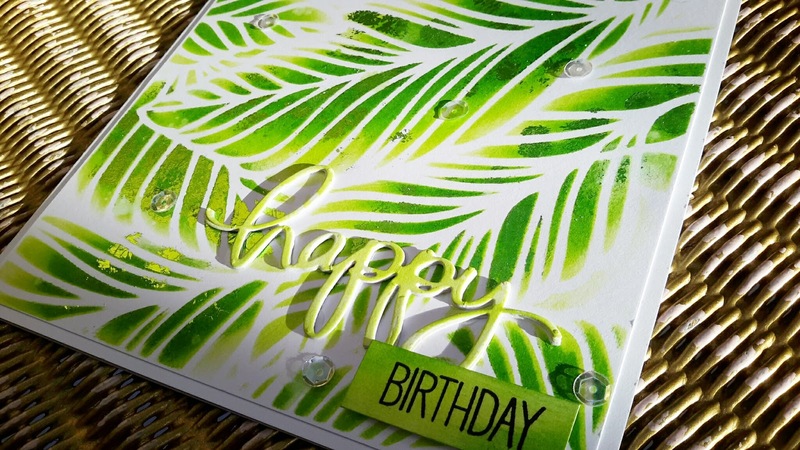 You could use glitter or embossing powder, anything you like. Just peel the stencil off and wash it before the gel dries!!! 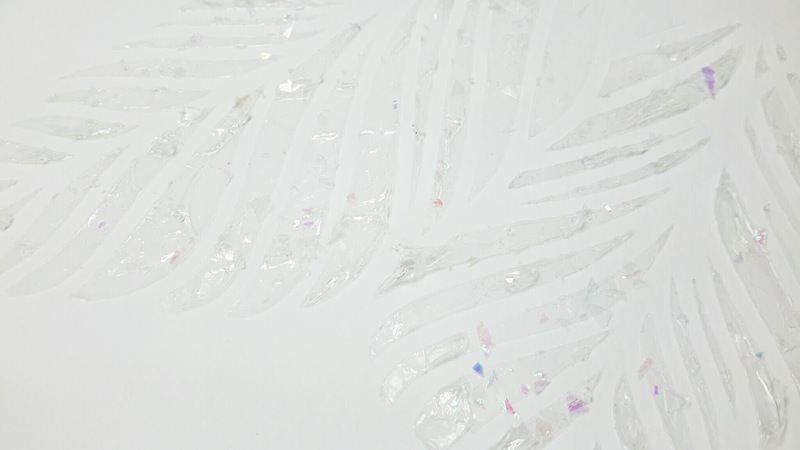 This makes a fabulous iced leaf effect, great for winter or Christmas cards. Now this stencil is STUNNING! It's the beautifully named Butterfly Burst. 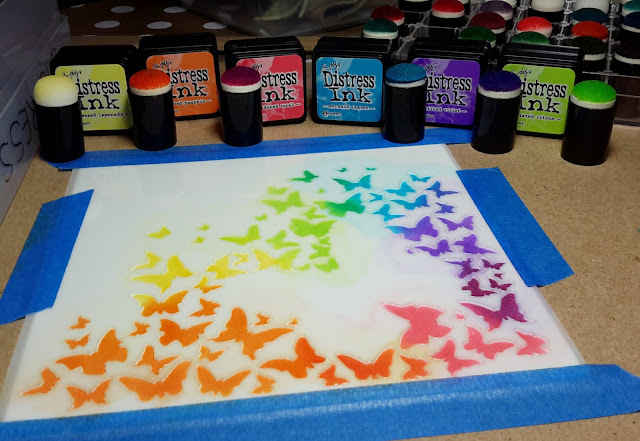 I taped the stencil down again first and added colour with a rainbow of Distress Inks using daubers. I then added a shimmer of glitter with a Wink of Stella pen and a few sequins. I hope you will come back tomorrow as I have so many more samples to share with you. In fact these stencils are keeping me awake at night as my head buzzes with ideas on how to use them. Before I go, here's an amazing offer for you. GET 20% off your order at Artistic Flair Crafts using this discount code. Hope all is well with you 😊. How pretty! The stencil is amazing and what great shine you got! And such a good photo of it too! Those stencils are wonderful! Wait to you try our soon to be released Deco Foil Transfer Gel! Made to work with stencils and our Deco Foil Transfer Sheets! It does need a laminator to set but gives beautiful dimension and amazing shine to our Foils!